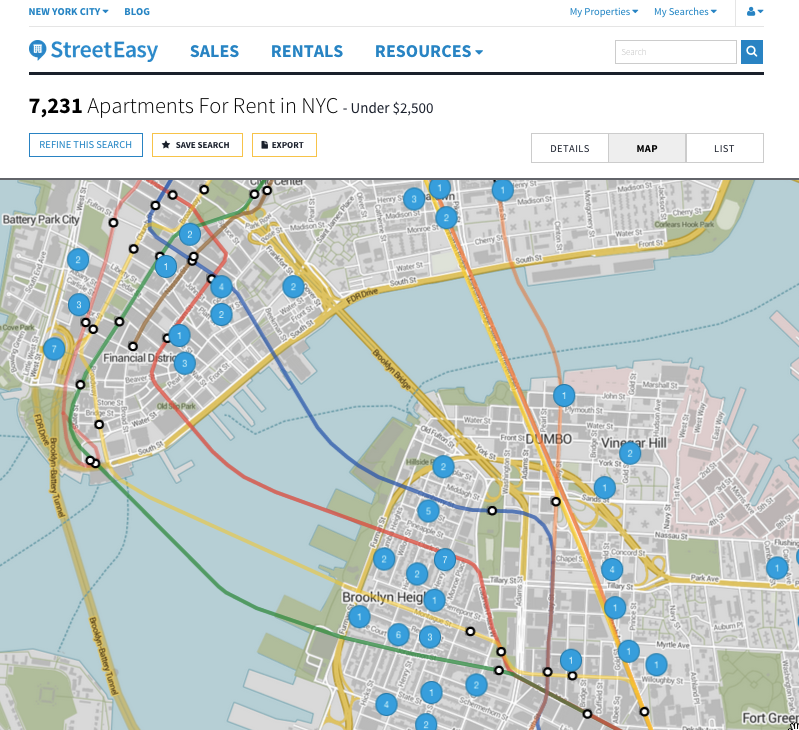 Proximity to transit can be one of the highest priorities for New Yorkers when searching for an apartment, and having them on the map gives a quick visual cue and helps narrow the search. 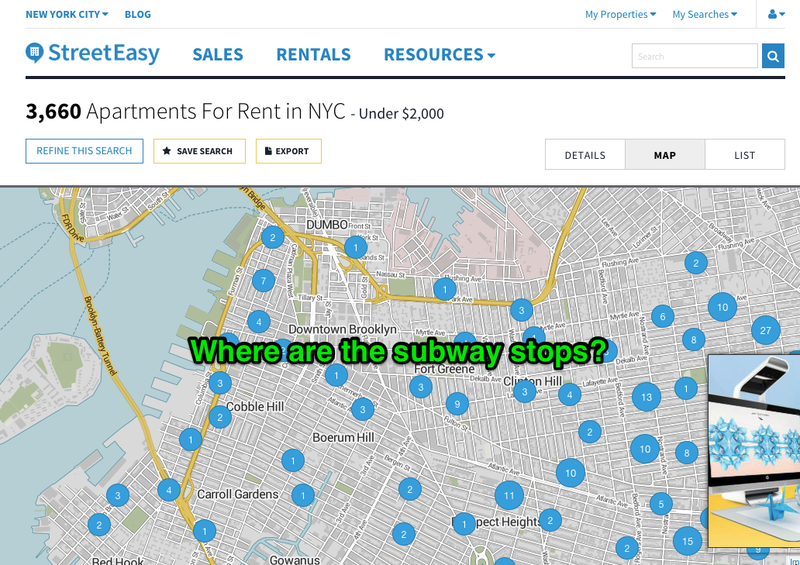 The missing subways inspired me to write a Chrome Extension to inject them into the map. Below is a screenshot of the extension in action. Read on for the gritty technical details. Leaflet makes it quite simple to add geoJSON to the map: L.geoJson(myGeoJson).addTo(myMap); To use this method, I need to get some data for the NYC subway in place of myGeoJson, AND figure out what name streeteasy uses for its map object. (most tutorials will simply call the map object ‘map’, but on a real website this is probably not the case). First, the data. 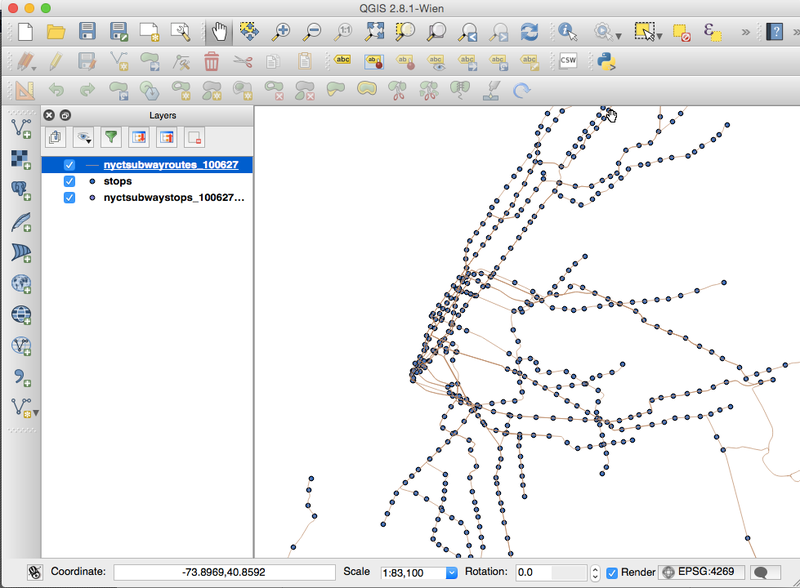 NYC data guru Steve Romalewski has a great post about extracting spatial data from New York City’s GTFS schedule data. He’s repackaged it as a Shapefile and shared it so others can use it in their GIS projects. A shapefile isn’t much help to me here, so I first had to use QGIS to convert the data into geoJSON. Some more digging through the source of the page led me to SEMaps._maps.map as the map object. Now I have everything to add my new layers to the map. Here’s the code of script.js. After setFeatures() parses out both geoJSON strings, the callback uses L.geoJSON() to add the new layers. Leaflet’s setStyle() method allows me to style the lines based on their route_id property, and for all you transit nerds following along at home, the MTA has a page with the official line colors! For the stops, I use leaflet’s pointToLayer option to create white circles with black strokes, a common symbology for subway stations. That’s it! You can try this extension out for yourself by following the directions on the github repository. Take a look and let me know what you think. If you’re searching for an apartment, I do not envy you but I hope this helps. This technique can be used to modify any leaflet map, as long as you can figure out what the map object is called. I look forward to seeing if anyone forks this extension and puts it to use on other websites that need a transit boost. Most importantly, I hope streeteasy will either add subway lines and stops to their basemap, or overlay them as geoJSON layers just like I did here, so all home-hunting New Yorkers can benefit! Thanks for reading, happy mapping! 2 Responses to "A Chrome Extension to Inject NYC Subway Data into streeteasy.com"
My name is David, and I’m a data engineer here at StreetEasy. This article was shared around the office and I just wanted to say how awesome it is. We love seeing people in the community make extensions like this. Nice work! Thanks so much! I’m glad this made it back to streeteasy so quickly!